The Southern Peninsula of India has been the abode of a great many Yoga masters who have made this region their home and sanctified the already holy region. South India escaped the mutilation that befell North India as it was more inaccessible to invaders and the many temples and ancient architectural marvels that are still standing here are a living proof to this truth. It is also seen in the living Vedic culture that still exists south of the Vindayas. Yogacharya Krishnamacharya (1888-1989) was a great master of this science who belonged to Mysore in Karnataka. Sri Krishnamacharya traced his lineage to the great Rishi Natamuni and imbibed the art and science of Yoga from Yogi Ram Mohana Brahmachari at Manasarovar that is at the foot of Mount Kailash. He used to demonstrate the stoppage of his heart for a reported more than two minutes on many occasions. A traditionalist to the core, he felt that Yoga must be adapted to the individual. The three main disciples of this master (Sri Pattabhi Jois, Sri TKV Desikachar and Padma Vibhushan Sri BKS Iyengar) have interpreted his teachings in different ways. His son and disciple Sri TKV Desikachar founded the Krishnamacharya Yoga Mandiram in Chennai and developed a system that adapts Yoga to the individual (the ViniYoga of Yoga) that is often erroneously referred to as the ViniYoga tradition in western circles. 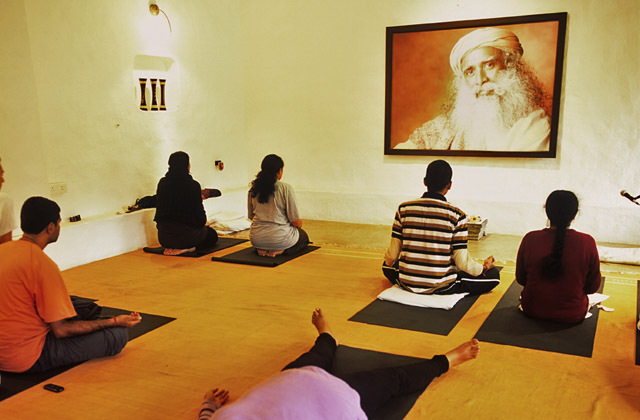 Emphasis on Sanskrit chanting with the Yoga is a speciality of this centre and the Yoga classes are tailored to the needs of each individual. Sri Desikachar has attracted a large following in recent times and his students led by Sri S Sridharan and Dr Latha Satish continue the Mandiram activities after his passing away in 2016. His wife Smt Menaka Desikachar and their son Dr Kausthub continue his illustrious legacy through their Krishnamacharya Healing and Yoga Foundation also located in Chennai. Sri Pattabhi Jois of Mysore another of the great disciples of Krishnamacharya has codified the system of Ashtanga Vinyasa Yoga based on the Yoga Korunta. This is claimed to be an ancient text that few have seen in which the system is delineated. Ashtanga Vinyasa Yoga has become a craze in the west with its vigorous nature ideal for those who ‘want to achieve something!’ His grandson is continuing his work in taking this system of vigorous Hatha Yoga to the west. Padma Vibhushan BKS Iyengar settled in Pune and his influence in western India is described later. It is interesting that these three disciples of the same lineage (Krishnamacharya) have codified quite different systems of Yoga through their Guru Parampara was the same. One of the most famous Gurus of modern times has been Sri Satya Sai Baba of Puttaparthi in Andhra Pradesh. His Prashanthi Nilayam Ashram at Puttaparthi as well the Ashram at Whitfield in Bangalore are his main centres while he has thousands of centres all over the world. Though not a Yoga Guru in the true sense he has been a master of Siddhis or psychic accomplishments. Another recent Mega Guru, Sri Ravi Shankar at Bangalore was a disciple of Maharishi Mahesh Yogi and with his Sudarshan Kriya (a specialised breathing technique) and his new age ideology has captivated the hip population of India to a great extent. His Art of Living has captured the imagination of many prominent personalities of the high society of India. His ‘Art of Living’ courses are being run all over the country and the world by his disciples and have become the Mantra for the upper classes and professionals. His movement has been likened to a second coming of the TM movement. A recent mega Guru from South India is Sri Jaggi Vasudev of Coimbatore, commonly known as Sadhguru. He founded the Isha Foundation, a non-profit organisation which offers Yoga programs around the world and is also involved in various social and community development activities, which have resulted in it being granted special consultative status with the Economic and Social Council of the United Nations. The Isha Foundation was founded in 1992 and is based at the Isha Yoga Center near Coimbatore, India and at the Isha Institute of Inner Sciences at McMinnville, Tennessee in the United States. It offers Yoga programs under the name Isha Yoga. The Isha Yoga Center houses the Dhyanalinga Yogic temple, a space for meditation that does not ascribe to any particular faith or belief system and was consecrated by Sadhguru in 1999. 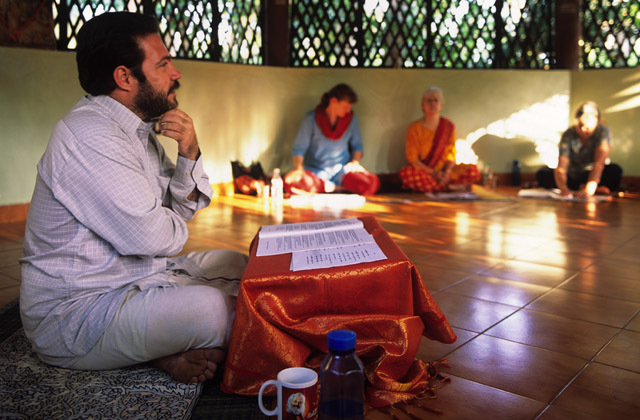 In Kerala, the Bhakti Yoga movement has flourished in Anandashram at Kanhangad. Founded in 1928 by Swami (Papa) Ramdas, this Ashram continues to serve aspirants on the path of self-realization. Swami Ramdas and Mother Krishnabhai both attained Samadhi through Bhakti for Lord Rama and Swami Satchidananda who has been a devotee of Ramadas since 1947 now runs this Ashram. Swami Atmananda (1889-1971) was a pioneer in introducing the Yogic and Vedantic concepts to the Malayalam population. He founded the Jnana Ashram at Sri Vyasa Giri and was a great source of inspiration to many spiritual seekers. Swami Vishnudevananda, a disciple of Swami Shivananda of Rishikesh, founded the Sivananda Ashram at Nayar Dam in Kerala and this centre continues to impart Yoga training in the Sivananda tradition to both Indians as well as westerners. Pondicherry has been a blessed city and the abode of Sage Agasthiya. Sri Aurobindo Ghose in the beginning of the 20th century and Dr Swami Gitananda in the later have cultivated it into a “City of Yoga”. Sri Aurobindo settled in Pondicherry in order to escape from the British during the freedom struggle and along with the Mother (Mira Alfassa) founded the Aurobindo Ashram that is world famous. His Integral Yoga and his ideas of the superhuman and super mental brought a great number of devotees from all over the world to Pondicherry. They settled down in the Ashram as well as the international township of Auroville to practice the teachings of Aurobindo and the mother. Sri MP Pundit was a close disciple of Aurobindo and the Mother and continued their work in a great manner. After his Maha Samadhi, Sri Shraddalu Ranade continues to inspire many on the path of Integral Yoga. Yogamaharishi Dr Swami Gitananda Giri founded the Ananda Ashram in 1968 and tens of thousands have received training in the Rishiculture Ashtanga Yoga (Gitananda Yoga) system through the Ashram and its branches all over the world. Swamiji was firm in his insistence that all his students have an understanding of Indian Culture from which Yoga sprouted. Known as the Lion of Pondicherry, Swamiji founded the International Centre for Yoga Education and Research (ICYER), as well as Yoganjali Natyalayam and these world-famous institutions, are involved in the propagation of Yoga. His Wife-Disciple Yogacharini Meenakshi Devi Bhavanani is one of the eminent Yogacharinis of the modern Yoga world and has served on numerous committees for Yoga and education including the CCRYN. She is currently a Member of the National Board for Yoga and Naturopathy in the Ministry of AYUSH and along with their son-disciple Yogacharya Dr Ananda Balayogi Bhavanani is continuing the work of the Yogamaharishi. The Chennai (Madras) Yoga scene has had many eminent personalities such as Sri Yogeshwar (TS Shankar) a retired journalist who wrote many books on Yoga. Sri Asana Andiappan, a student of Bangalore Sundaram and Swami Gitananda has also created a place for himself in the history of Yoga in Tamil Nadu through his work in Tamil. Taking the teachings of Yoga to the masses of Tamil Nadu in their mother tongue as well as being involved in Yoga Sports movement. His wife and children are assisting him in his work. The Yogasana Alayam in Chennai has also been involved in the propagation of Yoga amongst Chennai residents for nearly half a century. 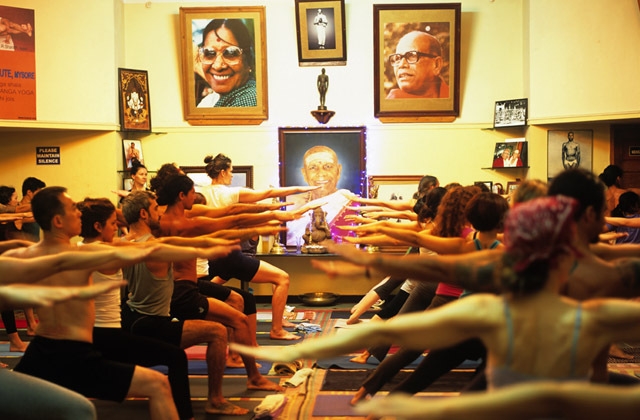 Founded by Sri GM Swami and then directed for many years by the late Sri Kalyana Sundaram this centre conducts regular classes for the residents of Chennai. Sri Kannaiah Yogi was one of the extraordinary Acharyas in the field of Yoga, Vedanta and Tantra in Chennai and lived for more than a hundred years. Padmasri Dr HR Nagendra, Chancellor, S-VYASA and President, VYASA located in the beautiful Prashanti Kutiram of Jigani near Bangalore has been the driving force behind the VYASA movement. 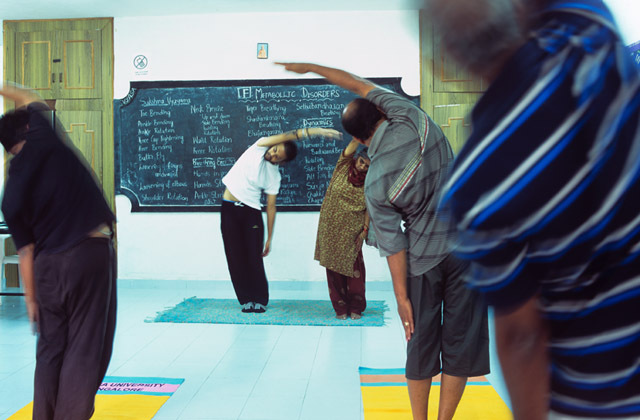 Dr R Nagarathna, MD, FRCP, MRCP, took to Yoga having studied and excelled in Modern Medicine. She travelled to all important Yoga traditions in the country and is credited with the development of the Integrated Approach to Yoga Therapy model. In 2002, Swami Vivekananda Yoga Anusandhana Samsthana (S-VYASA) which was an offshoot of VYASA but a separate society, was awarded a deemed-to-university status by UGC, by virtue of being a Yoga research foundation, had established high-quality research facilities; conducted robust, basic, clinical and applied research projects; Since then, S-VYASA has been reviewed and has been upgraded by UGC as a A-list University by MHRD review panel. Their work in Yoga Research and Yoga Therapy has been of great value in developing the scientific outlook to Yoga in the last few decades. Every year a conference is held to propagate Yoga as well as the Himalaya Yoga Olympiad to foster the idea of Yoga Sports. It has been associated with the top organizations around the world including MD Anderson Cancer Care Center, NIMHANS, IISc, AIIMS, KWA Kuratorium Wohnen, Karuna Trust and many others in its major areas of Yoga Therapy, Education and Research. Thousands of Yoga teachers have been trained through a unique Yoga Instructor’s Course program and many thousands of children have participated in the Personality Development Camps held from 1st to 10th class systematically. The first research paper by VYASA, Yoga for bronchial asthma: a controlled study, was finally accepted by British Medical Journal in 1985 after three years of rigorous reviews. Since then VYASA and S-VYASA have accounted for more than 350 papers on Yoga in standard, peer-reviewed, indexed National and International journals. NIMHANS in Bangalore under Dr T Desiraju and Manipal University under Dr Krishna Bhat have done a great amount of Yoga Research. Dr BN Gangadhar continues the rich legacy of NIMHANS as the director and has also headed the Advanced Centre for Yoga there for the past decade with numerous high impact publications. Sant Keshavdas with his Nada Yoga has also influenced many in Karnataka towards the spiritual and Yogic life. A master of Harikatha he used to enthral thousands with the magic of Indian Mythology and spirituality. Yoga in Contemporary India : An overview is an essay written Dr. Ananda Balayogi Bhavanani. This article series keenly observes the lineages of well-known Yoga schools and research centres in India.